Organized Before Delivery: Get Ready step by step! 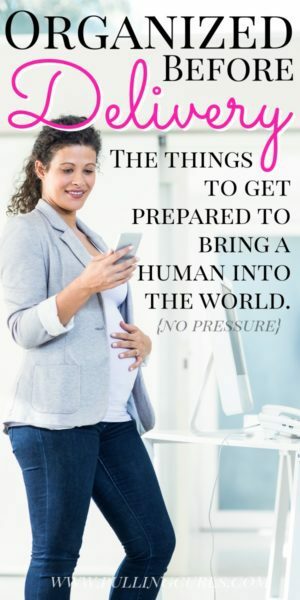 You are here: Home / Pregnancy / Organized Before Delivery: Get Ready step by step! Getting Organized before delivery will put your nesting heart at ease. Find out the TOP things to organize before your baby comes! Organized before delivery means many things to many people. Deep cleaning might be on your list, as well as other ideas. A lot of you might think this is on my list, but it is NOT. At least not for mom. Sure, clean what seems like it “needs” to be done (and depending on how hard you nest, a lot of things might “need” to be done) — but I encourage dads to help out a LOT with whatever you think needs done in this area. Reason: Depending on your cleansers and the areas you want to be cleaned, it may just not be good for you. Plus, I think you’ll do better at organizing the nursery as dad gets that tub clean! Also, this post is more about ORGANIZING stuff, vs cleaning it. Maybe I’ll do a post about deep cleaning before delivery soon! If you’re looking for awesome Organization Tips don’t miss my Organized Home Course. But, if you’re looking to clean, my friend Carly has a good post on how to get motivated to clean during pregnancy! If you think labor will be soon, don’t miss my When will I go into labor? quiz. While I basically ignored this step with all of my kids, it is an important one. I ended up rushing around trying to grab a few things when the day finally came. I have a whole post about what to pack in your hospital bag, so I won’t say much here, but the three things you NEED are this (although I LOVE this since you’re not tied to the wall), this (that is my favorite of all time) and this (unless you have a pixie cut). I think one of the smartest things you can do beforehand is prep a bunch of dinners. In fact, some of the smartest baby showers I’ve seen involve making meals for the mom-to-be to freeze. You can make casseroles in tin foil pans and freeze those, or Ziploc freezer meals are a great option as well (I love MyFreezEasy for that — she has SO many great ideas!). Yes, I would still have people bring you meals after you have the baby. But having a few meals in your freezer to quickly get ready afterward will be a HUGE help. You might think you could just run out and grab some food — but after a new baby, running out and grabbing something, takes on a whole new meaning. Plus, think of ways to add veggies into those meals, so you’re keeping nutrition up (even though you’re tired enough to just eat doughnuts all day). We have never lived by grandparents when we had a baby and had older children that needed taking care of. I would strongly recommend that at about 20 weeks you start feeling out who you might be able to leave your older children with. Grandma, if she is close by is clearly the best option. Grandma flies in — but you can’t always count on this if you go early, etc — and grandma being there is NOT a reason to get induced. A neighbor. Someone who lives close that can sleep on your couch if you need to leave in the middle of the night. Friends. With our last baby we had NO family around. I was pretty nervous about it but friends came through like champions. Felt very lucky. Daycare — maybe you’ll be lucky enough to have your baby while your little one is already at their regularly scheduled programming. It is nice to have your kids around people they know and trust while you are gone. Kids often get a lot of anxiety knowing their mom is in the “hospital” — the hospital can often take on “terrors” of its own (especially if a family member/friend died at one). Sidenote: If your hospital offers a sibling class I am a big fan of them. I think it just helps ease anxiety if kids realize that the L&D part of the hospital is special where only good things happen. It gives them a way to visualize where you are and what is going on and know they can come to visit you there. I do NOT recommend children be present at delivery. If you want them there, you need a separate adult (beyond your partner) to be in charge of them. 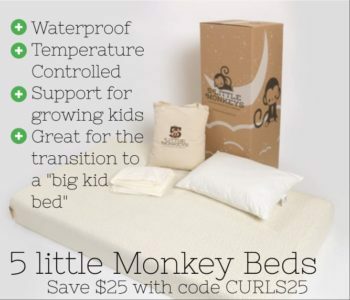 Another sidenote: If you need to move big brother/sister to a new bed, don’t miss my post on the best kids mattress. Bottles (I recommend everyone have at least one bottle, even if you plan to exclusively breastfeed, and I would also horde any free formula you get, just in case) — this is the brand I used. Somewhere for the baby to sleep. In the beginning, this can be VERY Simple, I always ask around to see if anyone has a crib or bassinette I could use. BUT, I also think this one looks SO smart! You should NOT be planning on the baby sleeping with you due to it’s SIDS risk. You only have this newborn once — and alot of things are SUPER handy, but really need to be available right when you come home. Swing — these come in all shapes and sizes, we use this one at work (LOVE IT), but I’d think about the footprint you can let it take up and your budget and then buy one. Owlet Monitor — hundreds of my readers LOVE This thing — because it gives them peace of mind. You can get it here, and you can read my full review here: Owlet Monitors. Co-sleeper — as I said the AAP recommends babies stay in your room for the first 6 months and I am LOVING all the stuff I am seeing on the market right now. So many cool co-sleepers on the market anymore! I made a full list of some awesome freebies for new moms that you can shop right here. Be sure to use code CURLS333 to get the discount prices! I also recommend a pack of just regular period pads. You should expect to bleed 2-4 weeks (it will likely get longer with each pregnancy). As a reminder you can’t use menstrual cups or tampons for post-baby bleeding. If you’re planning on a vaginal delivery, you might want to make-up some padcicles. But, if time is an issue, I just kept my tucks in the fridge and was pretty happy to stick those on my stitches too. Double check with your insurance that all your ducks are in a row. Some hospital stays need to be pre-approved. Also, check with your insurance to see how they cover a breast pump (that was part of Obamacare, but who knows if it will still be covered later).